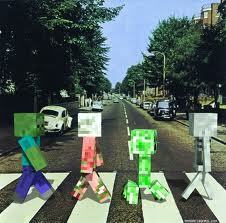 Why did the Creeper cross The Road? To get to the other Sssssssside! Why could't the Miner get to hid Diamonds?Some Thing was Blocking his way! What's the most popular Sport in the Minecraft World? B(l)oxing!!!!!! What's A Creepers Favorite Food? Sssssssalad! What did the Miner Sleep on when he couldn't make a Bed? Bed-Rock! What Mob can harm your Computer the most?(R)endermen! How Good is Minecraft? Top-Notch! If A Miner Was on Peaceful,How could he die apart from Lava & Big Drops? Die-Monds! What's A Ghasts' Favorite Country? The Nether-Lands! How do Miners Pick there Nose? Using a Pick-Axe! Hope you have all enjoyed These Jokes! Try Them Out on your friends and see what there reaction is! There Will be more jokes in a spoiler! My Mum got me Minecraft for my birthday. She said to me "It is now Your-craft! Do you like grassless dirt? Of coarse. l Iike the bedrock and Top Notch ones. I always knew the one about the Nether-lands!